We were very lucky to be invited down to Wandsworth to visit the new flagship store of Great Little Trading Company (GLTC). From the moment you step in the door of the new Great Little Trading Company (GLTC) store you feel welcome. We will offer you a cup of tea, and your children are positively encouraged to come and play with all the displays so you are immediately put at ease and feel free to be inspired. to explore how you can make life a little bit easier for yourself. Friendly and knowledgeable staff offer personal advice. 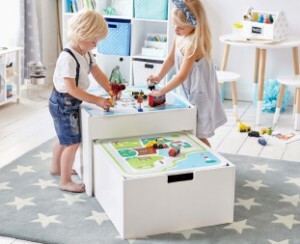 Making the showroom a unique shopping experience for parents. Looking for innovative design, quality, attention to detail, longevity and the highest safety standards. 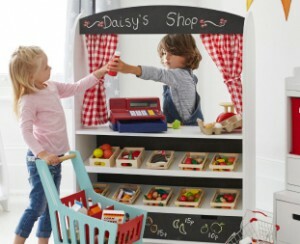 Key products include smart storage for toys, books and clothes, children’s bedroom furniture and bedding. 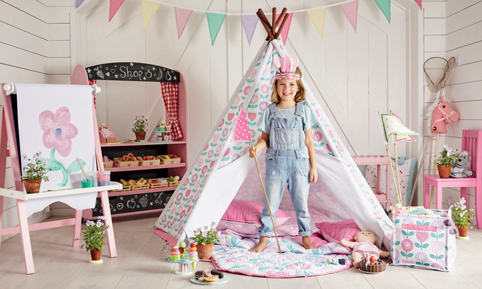 We love the star designs, curtains and rugs, desks and desk accessories, dressing tables and toys. ‘Children and families are at the heart of everything we design. We wholeheartedly commit to our promise that everything we make, makes a happy home.’ GLTC. – The Great Little Trading Co’s Showroom opens on Friday 29 April 2016. – Address: 12 Buckhold Road, Wandsworth, London SW18. – Parking available at the Southside Shopping Centre, Wandsworth. – Opening hours: 9.30 – 6.00 Monday to Saturday, 11.00 – 5.00 pm Sunday. The GLTC Name Label Guide.